Jewish Women, We've "come a long way, baby"
Just a few years ago, and maybe still at some venues, these so-called "women's topics" may still get some play. But today's modern, educated Torah Observant woman looks for spiritual and theological inspiration before Passover, not more recipes and cleaning advice. And the inspiration we crave isn't the "predigested" kind, it's intellectual based on the Bible and traditional Jewish commentators. We are expected to think, and not about color schemes and table-settings. 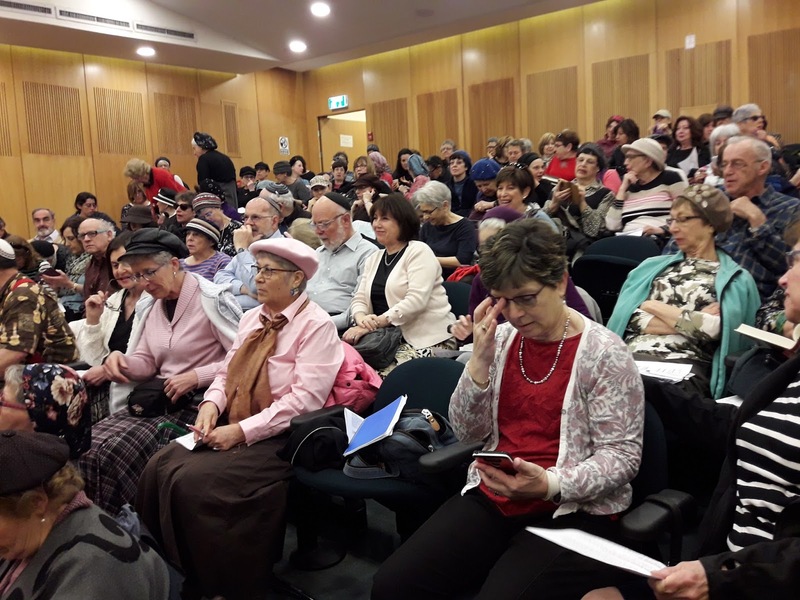 And the overcrowded Matan auditorium also had quite a few men sitting in the audience, as you can see. Another thing is that there were items for sale just outside the auditorium, but they weren't jewelry, tablecloths, scarves or hats. They were a large selection of books from Pomeranz Books for added inspiration and inclusion at the Passover Seder. I bought my grandkids the "Harry Potter" Haggadah, which was one of the big sellers, as many participants had the same idea I did. I didn't notice any cookbooks, but then, again, I'm not in the market for any. Today I spoke to Pomeranz who said that besides The Hogwarts Haggadah, the big sellers were Passover books by Erica Brown and Rabbi David Fohrman. Shabbat Shalom and Chag Kasher V'Sameach! 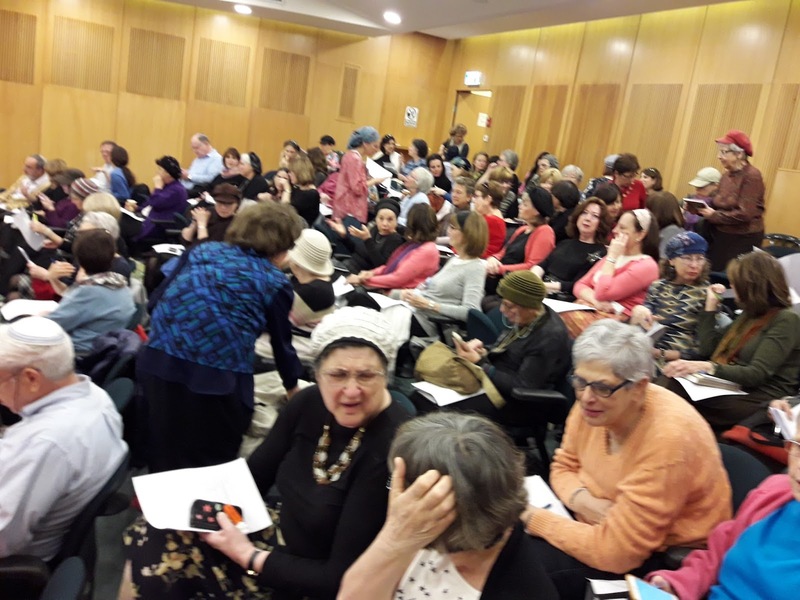 Yesterday, I was one of the hundreds of women and men who overfilled the Matan Auditorium to hear three of Matan's best teachers, Dr. Yael Ziegler, Rabbanit Shani Taragin and Yael Leibowitz. 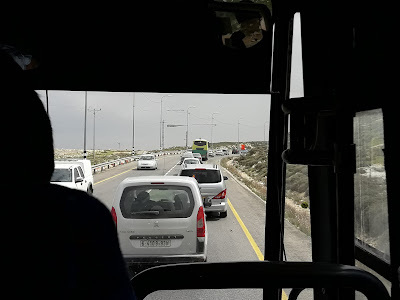 I thank Gd for the opportunity to have been there, which was due to the fact that in my present job teaching EFL Remedial English in Yeshivat Ahavat Chaim, my Passover break has already begun. 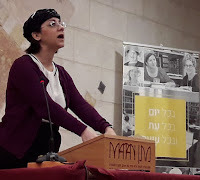 As every Wednesday morning in Matan, Jerusalem, for many years, Dr. Yael Ziegler opened the day with a totally spellbinding and inspiring lecture. Not one person interrupted, and Yael hardly took a breath as she enlightened us about the Plague of Darkness and its significance for the Egyptians and Gd's promise to the Jewish People. After a short break, Rabbanit Shani Taragin told us about Prayer, Passover and the Mitzvah to retell what happened to the Jewish People in Egypt. She quoted Rav Soloveitchik who had taught that those who don't recognize their own power of speech/prayer are slaves. 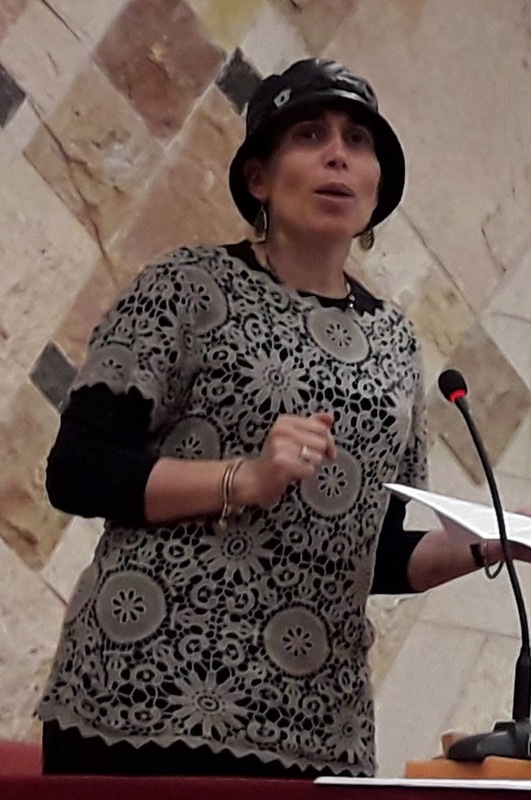 Lastly, Yael Leibowitz managed to keep us totally enthralled with her fascinating talk about the beginnings of the Jewish Nation including comparisons between Moses and Jacob. My friends and I walked out totally energized and inspired, even though we had been sitting and listening for over four hours. 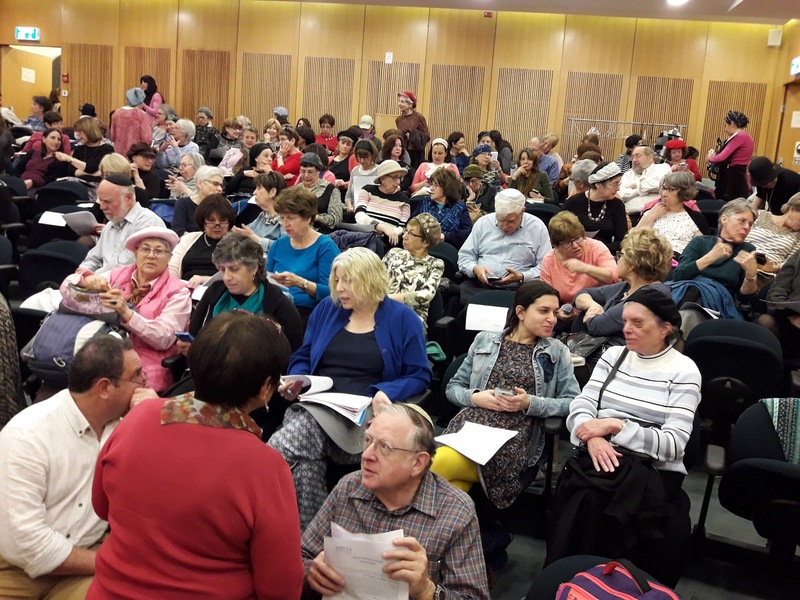 These pre-holiday learning sessions and the regular courses in Matan can be heard on their Matan Online site. Some are free, and others require payment. But once you subscribe, you can access all of the lectures. 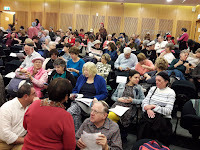 So, even if you can't attend Matan in person, you can still enjoy its classes. When I take my fitness walks, I listen to the lectures. Even those I had heard in person never bore me when I listen to them a number of times. Have a wonderful Shabbat, which should energize you for Passover, which is barely a week and a half away. Against All Odds, We're Back! 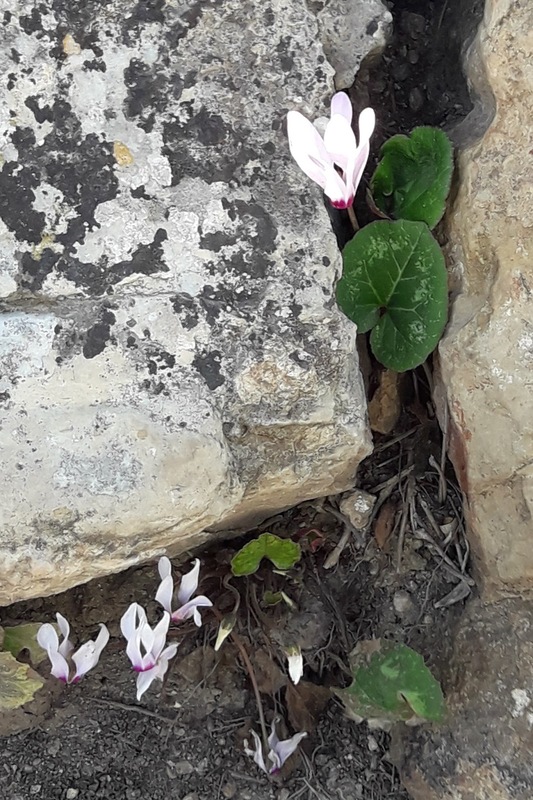 Yesterday, Rosh Chodesh Nissan, while my friend and I were slowly making our way from the Mishkan, Tabernacle area of Shiloh Hakeduma, Tel Shiloh, we couldn't help but admire the wildflowers, some familiar and some not, defiantly decorating the otherwise barren terrain. There was a time when our walk to and from the Mishkan, Tabernacle area during the months of February- April, Shevat-Nisan was like a magical adventure on an "oriental rug" of brightly colored flowers. But then the administration of Shiloh Hakeduma decided that clearing the remains of the uncontrollable plants once they had dried and become more like a clans of dangerous octopi and medusas was an expense to be eliminated. So they had poisons spread along the paths and nearby rockery, which aborted the growth and flowering of the otherwise legally protected plants. Therefore the last few years it has been terribly hard to recognize the season by flora, since almost nothing grew on that Biblical landscape, the same spot where Hannah had successfully prayed for a son, and Eli the High Priest had heard the runner approach and his horrendous news. Before weed, sic, killers had been spread on the Holy ground, it had been easy to imagine that Joshua, Hannah, Eli, Samuel, Elkana and all the other ancient Jews who had made their way to Shiloh had marveled at the beauty of the antecedents of the very flowers we were enjoying. As we admired the tenacity and chutzpah of these amazing flowers, I couldn't help but to compare them to the Jewish People who have also defied all of the "rules" of nature, history and warfare. We have survived thousands of years of exile. We have been victorious in wars when "everything" was against us. We have revived a language that had been considered as dead, and today its speakers excel in the most modern and innovative technology imaginable. We have reestablished the Jewish State thousands of years after it was invaded and destroyed. Wildflowers are the landscaping designs of Gd Almighty. And we, the Jewish People, are His People, too. I don't think I'm exaggerating when I say that things are getting much worse for Jewish People all over the world. I know that many will argue with me, but I consider the acceptance and teaching/brainwashing of anti-Israel policy and false history in international academia as proof of my thesis. The future can very well be worse than a combination of the Holocaust, Inquisition and Crusader times. Jewish People must all make aliyah, because in the long run, Israel will be the only place we can thrive and be safe. 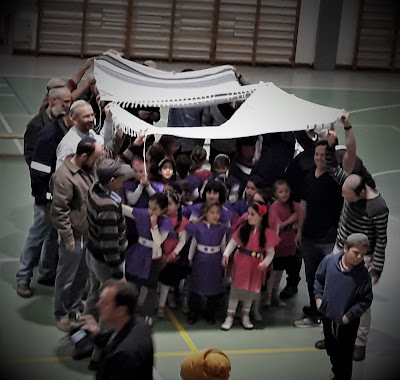 Here we are Rosh Chodesh Nisan, less than two weeks before Passover Holiday is to begin. We're not supposed to think of Passover as cleaning and feasting, because it's a much more important Holiday than just that. Historically, according to the Bible, it begins when ten brothers gang up against their younger, favored brother and sell/banish him. He ends up in a foreign country where he reaches a position of authority and leadership. Later Gd orchestrates a situation in which his entire family voluntarily exiles itself and joins him. They enter that foreign land as honored guests/immigrants being given the best land to cultivate and settle, but then everything changes. They find themselves dependent, enslaved by the ruler who has rewritten history to wipe out the good deeds of the brother. And for quite a while, just like the joke with the punchline, "we have three days to learn how to live underwater*," the Jewish People tried keeping quiet and cooperating. Yes, that sounds like Jews in Germany during the early stages of the Nazi regime. Gd waited until the Jewish People finally cried out to Him, and that's when He sent a leader to help them escape. Now, how much must happen until World Jewry admits that it's in trouble? How bad must it get until World Jewry cries out in pain to Gd for help? Unfortunately at this point, the wrong people are being blamed. There's an outrageously absurd situation when modern Hellenists aka J-Street and Company are supporting our enemies and attacking those who are trying to help us. For those who know Jewish History, this is all so sadly deja vu. Remember the anti-Zionists of Europe as the Nazis began their ascent to power? Now all of Diaspora Jewry is in danger. * (#1781) The three advisors [My thanks to John T for the following] As a result of global warming, a new flood is being predicted by all the world’s top scientists. They predict that it will be horrendous, wiping out maybe 70% of the world’s population. Not only that, but the Flood could be here in 3 to 4 days time. Oy vay iz meer! Many famous people start to appear on television giving advice. One such program has the Pope, the Dalai Lama and the Chief Rabbi appearing together. The Pope says, "It’s still not too late to accept Jesus as your Saviour." The Dalai Lama says something similar, "I appeal to all of humanity to follow Buddhist teachings. If you do, you can find nirvana in the wake of the disaster." But the Chief Rabbi has a totally different kind of message. He looks straight at the camera and says, "My people, we have just two or three days to learn how to live under water!" Will There be Real Changes in American Policy Towards Israel? The big question here in Israel and among many American Jews is whether or not the Trump administration will change American policy towards Israel. One great improvement, which isn't actual policy, is attitude. Obama couldn't hide his genuine antipathy towards Israel and Prime Minister Binyamin Netanyahu. Even when Obama would read pro-Israel speeches and say the "right words" it was clear that his heart wasn't in it. He absolutely glowed when with Arabs, especially Mahmoud Abbas. And don't forget that he had vowed to help establish a "Palestinian state" during his term in office. It was the failure to do so that spurred his vicious anti-Israel move in the United Nations and Kerry's awful parting speech while "lame duck." Contrary to what the New York Times and international media would like people to believe, not all American Jews support J-Street and oppose Jewish life/communities/building in Judea Samaria. 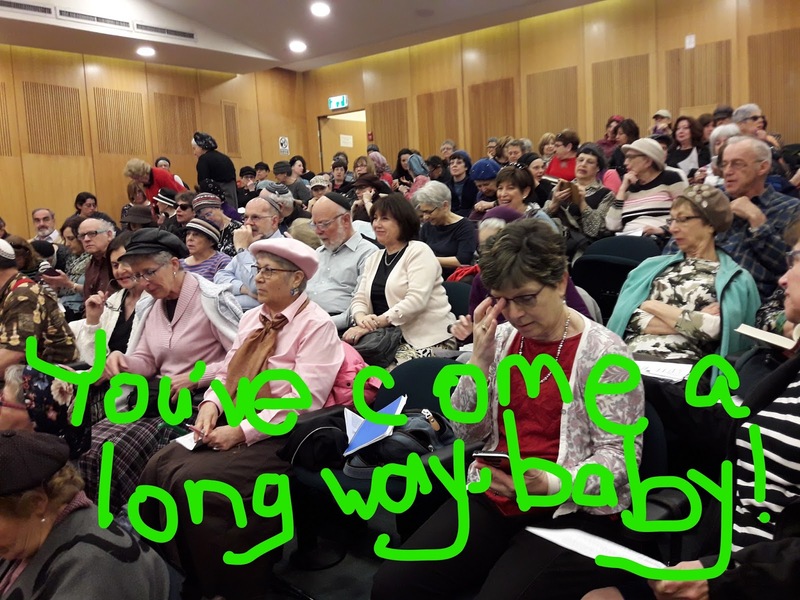 Davka, the most committed Jews, the Torah observant ones who have the higher birthrates, totally oppose the extreme Left J-Street and support full Jewish Life and Sovereignty in all of the Land of Israel. On the whole, they are totally embarrassed by American policy. They are proud and happy to have David Friedman as American Ambassador and look forward to the United States' moving its Embassy to Jerusalem. In all honesty, I wouldn't dare predict what Trump will do vis a vis Israel. At present, he is under so much pressure and opposition to everything he does, good and bad. Whatever happens, it won't really affect the State of Israel, because our fate and future are in our hands, not those of foreign leaders. Therefore the very best thing the State of Israel can do is to declare complete Israeli Sovereignty over all of the Land we hold. It doesn't matter what anyone says. The stronger and more confident we act the more respect and support we will get from the world, and the more support Gd will give us which is most important. That's the true lesson of Passover, which is in only two weeks. Rosh Chodesh Nissan in 2 Days, so Passover in 2 Weeks! Isn't it funny/strange/peculiar how these important dates just rush up on us without any real warning? And pretty much every year, before we've begun to take chametz for granted, it's already Yom Ha'atzmaut, Israeli Independence Day. But in the meantime, before then there are two Roshei Chodeshim, Nisan and Iyar. Please try to join us for at least one of them at Shiloh Hakeduma, Tel Shiloh, for Women's Rosh Chodesh Prayers. And to help you plan already for our Women's Prayers on Rosh Chodesh Iyyar, it will be on Thursday, April 27, 2017. Please mark it in your calendar/diary/event planner so you can join us, Gd willing. But if you want to talk about apartheid in the Middle East, there are many countries and a notorious "district" that practices it unabashedly. They discriminate against one religion, and that religion is not Islam. It's Judaism. The United Nations, United States, European Union etc. all support making large parts of the Land of Israel Judenrein. Judenrein means "clean of Jews," which is a form of apartheid, plain and simple. There is no logical way to dress it up into anything else, but somehow when it comes to anti-Jewish apartheid people refuse to accept/admit the truth. It's so easy to see how the Holocaust happened without any international protests as the anti-Jewish discrimination laws got more and more vicious morphing into death camps. It's a miracle that there were still Jews alive in Europe when the war ended, because saving Jews was not part of the Allied Forces battle plan. International antisemitism is getting worse, and I can't see an improvement at all. Universities all over the world have accepted and teach the lie that Israel is an apartheid state that stole land from Arabs. This can't be rolled back. I'm very pessimistic about the future. I feel safest in Israel. Here, at least, I can still blog the truth. David Friedman Approved as US Ambassador to Israel! Nobody knows if David Friedman, the newly appointed/approved American Ambassador to Israel will be able to make a difference, make policy at all, but many of us are very happy that he will represent the USA. Friedman has had strong ties with Israel all his life and even owns a vacation home here and is a very strong supporter of Jewish Rights to live in all of the Land of Israel, including Judea and Samaria. He is also a longtime personal friend of American President Donald Trump and helped him during the campaign, which is how he got the nod. Since being elected, Trump has backtracked on many of his campaign promises concerning Israel, or at least the promises his friends had made in his name. Gd willing, Friedman will succeed in getting Trump back on track to support Jewish Life and building in all of the Land of Israel. There's a very simple reason that Jerusalem Arabs, and other Arabs who legally can, are opting to take advantage of their right for Israeli Citizenship. The PA-Palestinian Authority and Hamas-ruled Gaza are horrendously corrupt and cruel. Of course, their lives are in danger if they give that reason. For close to six years I worked with Arabs in Yafiz, Sha'ar Binyamin. We had many Arab customers, and there are always Arab workers in Yafiz and Rami Levy. The Arab customers and I would communicate in Hebrew, English and pantomime. I even learned a few words in Arabic, like nus, which means half, so I could tell them that we had a "half-price sale." In the early years I worked there, we'd have a lot of Arab customers, especially those who had lived abroad and/or worked for some of the NGOs. For them, shopping in the "Israeli island/oasis" of Sha'ar Binyamin was "like being in America." That's what they would tell me. 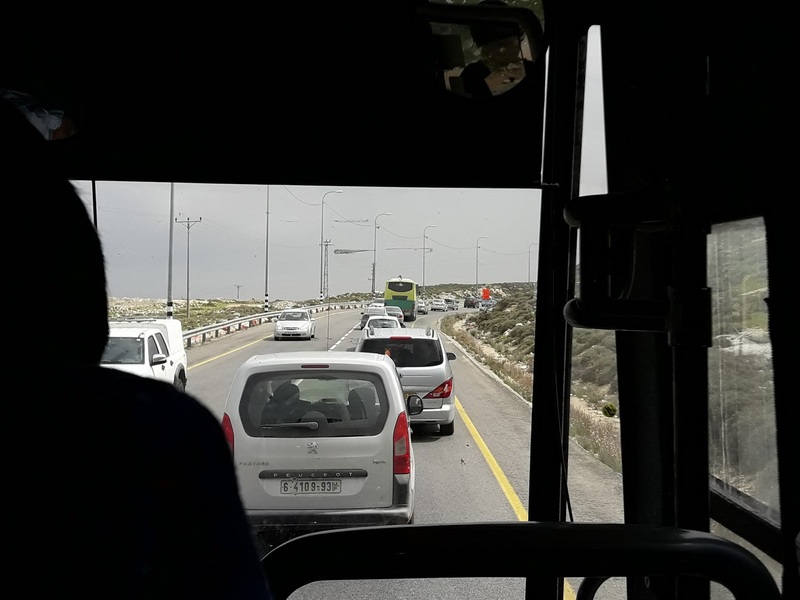 It also used to be common for vans loaded with Jordanian (and other Arab) tourists to arrive in Sha'ar Binyamin for "shopping tours," like what you see in American "outlet shopping centers/malls." Arab businessmen would tell me that they were buying for their wives and children, "because you have better children's clothes than in Dubai/Kuwait." But the last couple of years I worked in Yafiz, there were far fewer Arab customers. We were told that the PA-Palestinian Authority had been enforcing a boycott of Israeli stores. There were even roadblocks by PA Policemen who would confiscate whatever they found in Rami Levy or Yafiz bags. Another reason that Arabs prefer Israeli citizenship is the health and social benefits Israelis get. The Israeli minimum wage is considered an excellent salary for those Arabs not "on the take." And Israeli medical care is among the best in the world. The healthcare system is also superior and less expensive than you have in most of the world. And of course, as Israeli citizens, Arabs can live in Israel and not be dependent on the whims of the corrupt and cruel Fatah and Hamas. 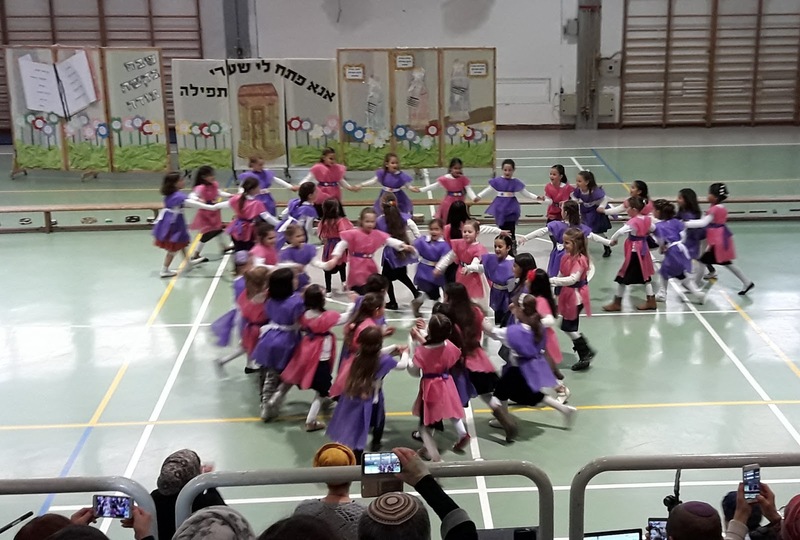 One of the big events in the school year here in Israel, at least in the religious schools, is the מסיבת סידור Missibat Siddur, The Siddur Party, when the First Graders get their Siddur, Prayerbook. In Ofra, where some of my grandchildren live, it's a big extravaganza. This year the girls school held it in the gymnasium sports center, and it's attended by parents, grandparents, siblings, aunts, uncles and more. Part of the program is prerecorded. The children are asked to say what they are praying for. This year there were the usual prayers for babies, more friends, success in school and building the Holy Temple. But there was also a prayer that isn't normally heard. Some of the girls asked for a new home, a rebuilt Amona. 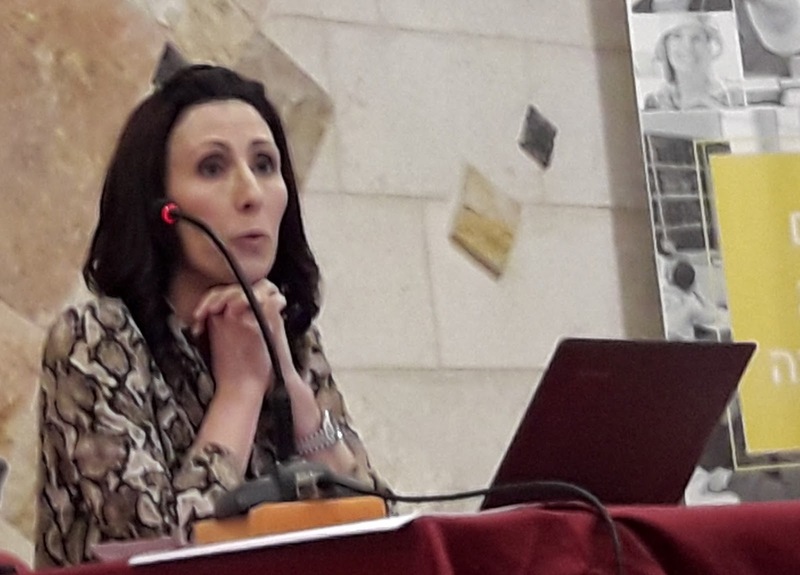 Most of the children who had been displaced from their homes, whether Amona or the nine homes in Ofra which the government destroyed, study in the Ofra schools. So when little girls sweetly and innocently said they were praying to Gd for a place to live, there was an unmistakable gasp by the audience, and many had trouble holding back tears. It's especially difficult when parents are unable to protect their children from such pain and heartbreak. Americans, So You're Not Happy With Trump? Change the System! As I've written before, the two main party nominees for the American Presidency were the two worst in the History of the United States of America. And as "unsuitable" Donald Trump may be as POTUS, I still shudder at the thought that if it wasn't for the Electoral College, we'd see Hillary* and her crooked cronies in charge. I'm a remedial teacher and have a knack to describe complicated things rather clearly. So, here's my very simple explanation why and how Donald Trump managed to mow down all the other Republican wannabes. Yes, by giving ordinary Americans the opportunity to choose a candidate, it was pretty easy to predict that they'd choose the better showman. Voters confused reality television with reality. Viewers loved the outrageous Trump statements, which encouraged news channels/sites to give him oodles of free publicity which snowballed and saved him advertising money. The financial cost of Primaries is so high that only the wealthiest or those with the richest backers** can afford to compete. And there's another reason why Trump won, and that's the one even harder for the Democrats to accept. They just aren't in synch with the ordinary American citizen, rich, poor, Right, Left and Center. Yes, I know that many of you are about to shout that Hillary won the popular vote. Yes, she did, but that was due to her support in just a couple of very heavily populated states. The county results of 2016 should be taken very seriously. Democrats lost in the House, Senate and Governorships. 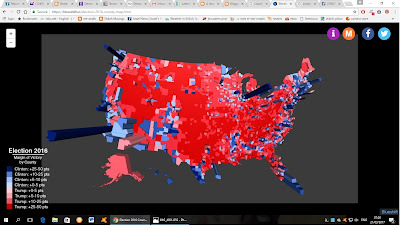 ALL THAT RED AREA VOTED FOR TRUMP! Spooky, isn't it? Before the Primaries season, Trump hadn't a chance at all. When he campaigned in the Primaries, even if Trump, himself, didn't take his campaign seriously, ordinary Americans did. And by the time the Primaries campaign was over enough American voters had identified with his anger and fears to support him, even though most of the media, plenty of their favorite athletes and pretty much all of Hollywood kept insisting that he was an unqualified, dangerous nut case, and they should make Hillary the first female President of the United States of America. If the Democrats want to win, they must understand that ordinary Americans did not relate to their platform. They found many of the campaign promises, and the "accomplishments" of the Obama administration terrifying. And now, they still feel attacked by the Left, because Trump isn't being given a fair chance, at least in their eyes. If the Democrats were smart, they'd just let Trump fail on his own. If the Democrats want to win, they should be quickly grooming some young Centrists to run in 2020. And if Americans want more qualified nominees, they must rollback the Primaries or they'll just get more and more reality stars in high office. *It's not just that she's anti-Israel, but don't forget all the foreign funding supporting her fake "charity." **That is how Hillary Clinton dominated the Democrats. She had already contracted with all of the big Leftist money well before the Primaries even began. Considering that the norm in Israel is to have elections earlier than legally scheduled, the country always suffers a form of "election fever." Yes, think of it as a chronic "infection." There's never a guarantee that your vote will produce an MK here in Israel. Besides scheduled Knesset, remember that here the MKs are elected on party lists, not as individuals, Elections, there are two basic ways that elections can be called. One is that the ruling coalition loses a crucial vote which "brings down the government," and the second way is for the sitting Prime Minister to "call for early elections." The Opposition has to grow to a considerable parliamentary strength for the first, which means that coalition MKs must have deserted the ship. Prime Ministers usually call for early elections when they think they can improve and expand their coalition. But that is risky, because as PM Netanyahu recently discovered; polls can change in a jiffy. It's no secret that two young party leaders are dreaming of unseating long-serving Prime Minister Binyamin Netanyahu. They are Yair Lapid and Naftali Bennett. Bennett is trying to do it from the inside and the Right. Leader of the NRP, now called Bayit Yehudi-Jewish Home, Bennett has had a rather turbulent relationship with Bibi. He's trying to make history by radically changing the NRP from perennial sidekick to national leadership. Yair Lapid came from the Left, forming his own party, which has been evolving to more Center Right in his quest for the "big prize." And recent polls show that his Yesh Atid, There's a Future, is running neck and neck with Netanyahu's Likud. But it's very possible that Lapid will have the same unpleasant experience that Tsipi Livne had a few years ago when she was at the helm of Kadima. Even though Kadima had scraped by with more MKs, than the Likud she wasn't able to form a ruling coalition. Bibi succeeded, and Tsipi is now just a postscript in Israeli political history. Remember that Netanyahu hasn't lasted as Prime Minister all this time by chance. He's a very experienced and wily politician. I don't think that Bennett or Lapid will have an easy job unseating him. They'd have to join forces, sort of like the rotation that Labor and Likud tried in 1984 when Yitzchak Shamir and Shimon Peres took turns as Prime Minister. Yes, that's pretty hard to imagine, but the Shamir-Peres deal also seemed more like Political Science Fiction. Weekly Torah Portion, Ki Tisa, "Dumb Question"
Add this to my series of "dumb questions." I have a lot of questions about this Torah Portion and Biblical narrative. Did you ever think about these things? For the longest time this has bothered me. Until quite recently, time was pretty general-inexact, and since there was no way to communicate with people on the go, we didn't get all that surprised when someone was late. And it's only in the recent century or two that pretty much everyone had a watch with them, and each house one accurate clock or more. Of course today's world is so very timed and controlled. But we all know that even a few years ago, when a family member or friend traveled, like when my son did his after the army trek in South America, days and even weeks could go by without any communications. We had to just pray and trust that all was well, or we'd go insane. 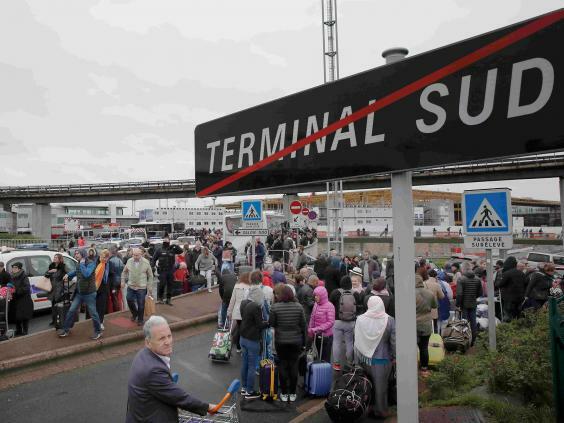 All sorts of normal, benign, conditions could cause delays in even the most planned contact schedules, arrivals etc. That's why I could never understand why/how, during an era when the hour was judged/measured by the length and angle of shadows, and there was absolutely no way to communicate further than a shout or "smoke-signal" away, the recently escaped from slavery Children of Israel, nascent Jewish Nation, could so quickly freak-out, panic, lose faith that their leader Moshe would safely return. There had to have been something insidiously planned by trouble-makers to rally the people so quickly against Gd, Moshe and Aaron. Considering the massive number of people and how long it would take, if it had truly been spontaneous, for this rebellion to reach a pinnacle of action. Being logical, it would have taken a few days to get organized, collect the gold, melt it down and form a "calf." And how long would it take for this "golden calf" to harden and be ready for display? The Biblical account is very dramatic, telling of how Moses in great anger broke the tablets Gd had prepared for the Jewish People when he saw them worshipping the golden figure. From the text, Moses came down just hours or at most a day after the people had panicked, so how could they have so very quickly produced an idol to worship? It doesn't make sense to me. Does anyone have some answers? We live in a very dangerous world unfortunately. Nobody is immune. And some countries have gotten quite a few attacks. Israel is not the most dangerous country to be in. I see danger and chaos all over, even in the United States of America which was once the most powerful, wealthy and stable and safest seeming country in the world. "Why would you want to move to Israel when all the Israelis want to leave it?" But there was no arguing with me and my husband. We just got on that boat and never looked back. That was in the summer of 1970. Israel was a more difficult place than New York to live then, but it didn't stop us. We took the 1960's simplistic non-materialistic idealism and combined it with Jewish Zionism. And then we went up a notch in 1981 when we made Shiloh our home. In the early years it was a challenge, but conditions were certainly much easier than the early Zionists endured. Yes, we have always considered ourselves and our moves to be continuations of Zionism in its most basic form. Remember that the early Zionists all of the Land of Israel as a potential home. And prior to that there were Jews in many cities including Gaza, not just Jerusalem, Hebron, Tzfat and other holy cities. Today Israel is not only an internationally well-known high-tech haven, but traditional Biblical crops are thriving too. In another few hours it will be Shabbat, so I'm logging off for now. No Anti-Arab Apartheid in Israel/YESHA etc. The roads I travel between Shiloh and all over Israel have both Arabs and Jews on them. 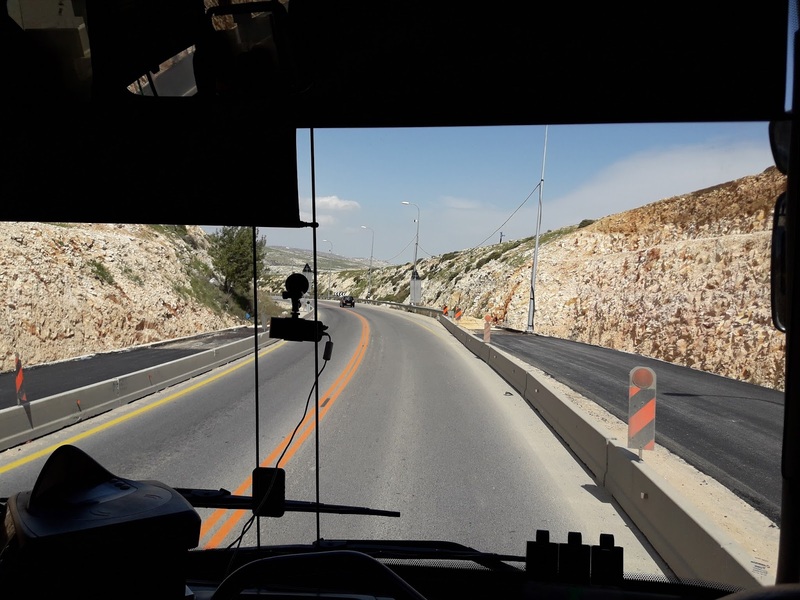 And all of us, Jews and Arabs will enjoy the improvements being made on the road between Shaar Binyamin/Ramalla and Jerusalem. The United Nations purposely distorts the situation to propagate and incite against Israel. It doesn't matter what Israel does, the international anti-semites, Left, Right and Center will find ways to interpret the facts to make Israel look bad. Decades ago when Israel began to promote "autonomy" to allow the Arabs in the land Israel liberated in the 1967 Six Days War to rule themselves in administrative and municipal matters, the intention was to reduce "occupation." But of course this has been distorted by world bodies into something anti-Arab. It morphed into the P.A. Palestinian Authority, which is among the most corrupt regimes in the world. Local Arabs fear to protest, because such an act could be fatal. The P.A. Palestinian Authority gets outrageously large amounts of money from international bodies, while many/most basic services are covered by Israel, Israeli taxpayers no less. Most of their funds go to the pockets of their leaders, and the rest is sent as stipends/"pensions" to Arab terrorists and their families. Yes, the United Nations, European Union and innumerable NGOs financially, politically and ideologically support Arab terrorists. But we all know that only Israel is condemned for immoral, sic, policies and actions. 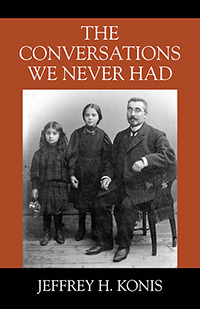 Reflections and Review: "The Conversations We Never Had"
"The Conversations We Never Had" by Jeffrey H. Konis is an amazing book. I'm not quite sure what the genre actually is, since it combines biography, memoir and fiction. Konis, like many of us is in a quandary. It's only when much too late he realized that he had missed a great opportunity to learn about his father's family, especially his father's biological parents. His grandparents weren't actually his grandparents. They were his father's aunt and uncle, because his grandparents had died during the Holocaust. After the war his grandmother's younger sister and her husband adopted his father, and the three started new lives together as a nuclear family in America. I found "The Conversations We Never Had" and couldn't put it down. Prewar Europe really comes to life here. All of the characters are believable. I had to keep reminding myself that it is mostly, if not all, fiction. It's a pleasant and easy read, very well written for the most part, and I love the fact that the book has large easy to read print. I caught a couple of mistakes a good editor should have fixed, but that's not the end of the world. One should be corrected, because for anyone who knows the fact it can shed doubt on the possible accuracy of the entire book. Konis asked his Grandma Olga why his father's parents only had one child and was told that his grandmother had miscarried many times. Konis should have left it at that, but he continued with an impossibly inaccurate for the time "detail" about the miscarriages. Firstly, pregnancies were followed and described by months not weeks until close to the end of the 20th century. Secondly, fetal heartbeats couldn't be heard as early as nine weeks until the 1970's. When I had my older children in the early 1970's doctors could only hear heartbeats about the same time that the baby began actively moving in the womb. This bothered me, but it certainly didn't make me put the book down. Konis is a very talented writer. His Grandmother Olga certainly comes alive as does the story he imagines for his grandparents. No doubt that most is very plausible. While reading his book I was reminded of how I don't know about my grandparents. I definitely recommend buying "The Conversations We Never Had." I don't know how far and wide the exposure and publicity Richard Gere's Israeli interviews have gotten, but they got intolerably too much press here in Israel. As the entire world heard at the pinnacle of the Academy Awards presentation this year when veteran and revered actors Warren Beatty and Faye Dunaway showed that their specialty is reading lines, not comprehending them. Richard Gere's statements are on the same track. The utter nonsense Richard Gere has spouted as his plans for the Middle East is as realistic as the worst of Science Fiction or at best Fantasy. Gere reminds me of my students' insistence that James Bond was a real historic character, and the books and movies were based on true facts. Gere is a convincing actor, but that doesn't mean that his knowledge and understanding of the situation here is more than superficial. All he's doing is repeating the Obama-Kerry lines, which we all know are based on a pro-Arab, pro-Palestine even if it causes the destruction of the State of Israel ideology. Honestly, anyone who thinks that the corrupt terrorists ruling in Gaza and Ramalla can morph into peaceful, tolerant and reliable leaders has been watching (or acting in-- like in Method acting) too much Hollywood fantasy and Science Fiction. The utter irony is that some of his words were totally on target, but his Leftist ideology distorts his comprehension of reality. Considering Gere's visit and Purim Holiday, we can see that Gd has a great sense of humor. 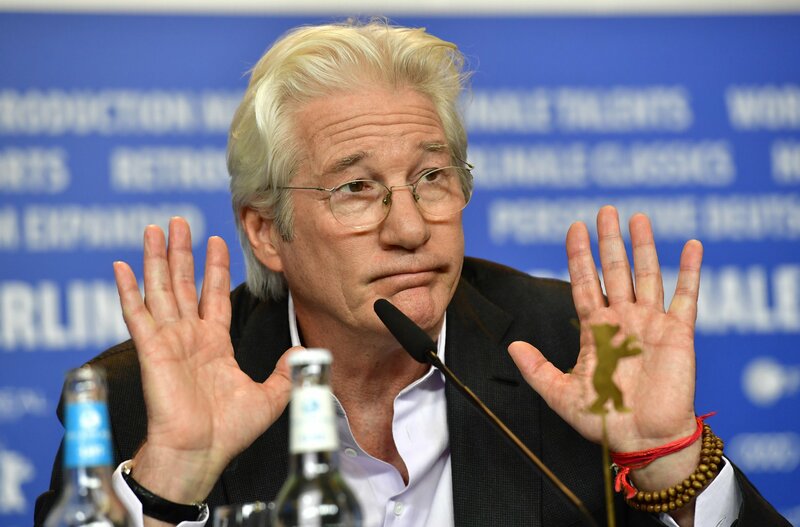 You can read it that Richard Gere admitted that his "truth" is a lie, since “Truth is dead" in his very words. The real Truth is you must take Gere's message and reverse it. Israel is meant to be in all of the Land liberated in the 1967 Six Days War. Recently there have been reports about the Arab terrorist who murdered seven Israeli schoolgirls being released from jail, totally unrepentant. And the European Union hasn't pulled the plug on all the money they give the PA-Palestinian Authority even though they use it to indoctrinate their schoolchildren to murder Jews. So, as you can see, we still have a lot of work to do to destroy Haman and all his descendants all over the world, including here in the Holy Land. The Purim story is NO JOKE! The riots against Murray and Yiannopoulis alerted non-Jewish Americans to the intellectual and moral decay of their campuses. An acrid stench of repression is spreading through America. Last Thursday, conservative political scientist Charles Murray from the American Enterprise Institute was attacked by a leftist mob at Middlebury College. Murry was invited to Middlebury by the college’s AEI club. He was to discuss his new book, Coming Apart, which discusses the plight of white working class Americans. Middlebury’s liberal political science professor Allison Stanger was set to ask him questions about his work. As has been widely reported, a mob of leftist students prevented Murray from speaking. They shouted him down with a stream of epithets that went on without interruption, until Murray and Stanger were spirited out of the lecture hall. They were brought to another location where they carried out their conversation in front of a camera that was livestreaming to students blocked by the mob from hearing them in person. The mob followed them to the new location and rioted outside the room as they spoke. The rioters assaulted them as they made their way from the second location to their car. They hurt Stanger in the neck. The assault continued after the professors entered their getaway car and at the restaurant where they tried to dine at with students. In the end Murray and his companions were forced to leave town in order to have dinner away from the rioters. Stanger was later treated for her wounds at a local hospital. As I read this on Shabbat, I knew that it was the perfect message for Purim. Haman is alive and still trying to murder not only all of the Jewish People, but all who refuse to accept his/their ideologies.